Specifically designed and tested for flawless performance in surplus M1 Garand rifles! 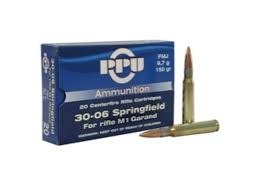 Loaded to slightly less pressure than most standard .30-06 cartridges, Prvi Partizan Ammunition will not damage the operating rod of these older firearms. These features also make this a great reduced-recoil load for modern bolt action or semi-auto firearms.